Our journey with the Doxies started back in 2003. Here is where you find out about us and our Dachshund puppies. We strive to produce healthy quality Dachshunds puppies with excellent conformation and temperament. Draw your own conclusions by reading about us and our Dachshund puppies. Our daughter came home on Mother’s Day with a small paper bag in her hand. I noticed the bag was moving as she was walking up the hill. She handed it to me and said “Happy Mothers Day”. Well, I opened the bag and there was this black “spotted” puppy. I had never seen a puppy like this so I asked her what kind it was. She said “why mama, it’s a silver dapple Dachshund. It sure was a strange looking little creature to me because we had always had Poodles! We named the puppy Gypsy. Now I know that she was a smooth coat black and tan silver dapple. That little girl won our hearts and it has never been anything but Doxies for us since. We decided to share our new found love and joy with other folks. Thus, Louie’s Dachshunds was originated. They are such a big part of our lives that we just can’t imagine being without them. 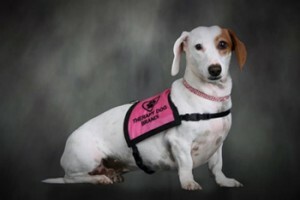 Our goal is healthy quality Doxies with excellent conformation and temperament. We try to breed them as close to standard as possible. We want you to be as happy with your Doxie as we were with Gypsy. We are located in the mountains of western North Carolina right on the Tennessee and Georgia border. You are welcome to come by and visit with us, call us, or email us.